So, how’s NaBloPoMo going for you? It’s hard for me to say if it’s a good or bad thing just yet – I’m not finding it too difficult to blog every day since I *do* knit every day, I just hope it isn’t too boring for the readers! Pan likes to help by inspecting the items being photographed. See, the thing is, I don’t really like ribbing. 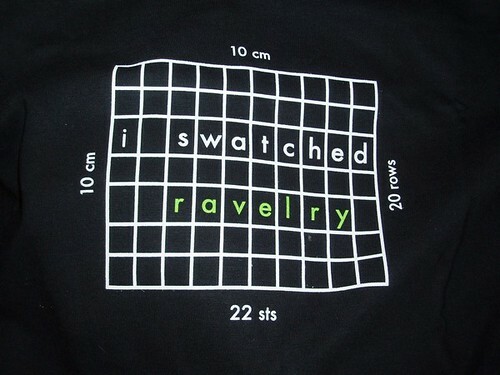 (Yes, I know I just knit an entire sweater in 2×2 rib.) I think this pattern will turn out well in this yarn, but I don’t enjoy the actual process of knitting the ribbing much. I often get the urge to cast something on, start it, and then leave it lying around in a sock bag on the top of my dresser stalled at the ribbing, like I did with these guys. Unfortunately for them, they’re *entirely* ribbing. I started them in October but then got sidetracked with the Frankensocks and the Secret Spook socks. * Funny thing… I was looking back at that post from when I first got the Fabel yarn and I realized I had written about buying thread to sew my Spork. Well today I actually did some of the sewing on Spork too! I need to locate the bag that contains the straps and clippies to hold the flap closed, but I had the bag itself with the shoulder strap and I sewed the ends of that strap together and sewed them to the sides of the bag so the Spork is now usable. 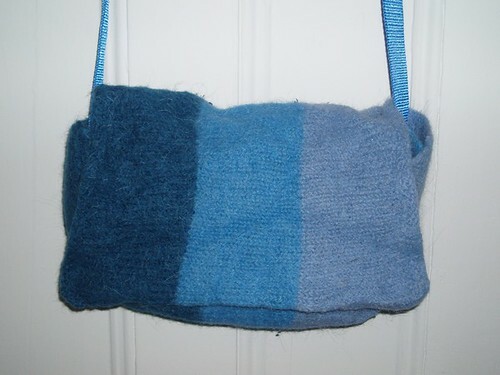 But, at any rate, it’s a very good pattern and produces an adorable bag. It would also be really easy to size up or down, or to change the shape, just by doing some simple math. 2×2 rib drives me insane. I knit socks toe-up just for that reason. If I had to knit 6-8″ of ribbing before I got to the “fun parts”, well, I have several sock-cuffs only half done because of that. I’m not a fan of ribbing either, but it is sort of necessary evil for the socks. 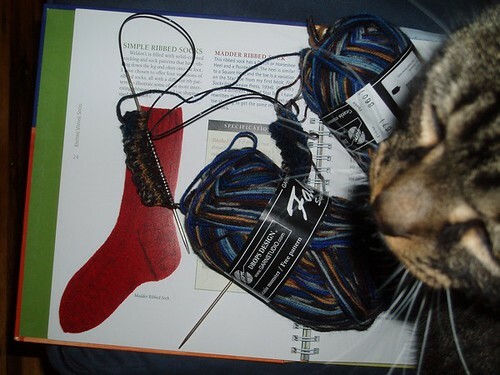 I can’t wait to see your finished socks – I liked the blue and brown of that yarn.